D-E-P-R-E-S-S-I-N-G. That pretty much sums up the subject matter in Capstone’s 6-titled series “The Environment Challenge.” Actually, the series might be better described as “The Environmental Myth of Sisyphus;” while specks of hope and corrective measures are sprinkled throughout the works, the misery, degradation, and sheer enormity of the environmental crisis seems awfully daunting and practically insurmountable. At least that’s how I felt after reading these titles. Designed as a way to get reluctant readers jazzed about literary leisure (or homework) time, Capstone created what it has coined “Freestyle” books, which are chock full of intriguing graphics to help visualize and contextualize the text, shorter sentences with less challenging vocabulary (although word banks are found throughout the series), and information that’s presented in easier-to-digest chunks. 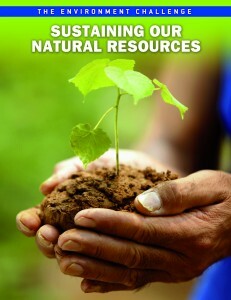 Sustaining Our Natural Resources. Provides an overview of: nonliving resources (minerals, fossil fuels); damage to environmental resources (water, soil, air); the living world (deforestation, overfishing, wildlife trade); our growing population and limited resources, and; sustainable living. Bridging the Energy Gap. Reviews fossil fuels, wind and water power, sunlight, and ways to use and waste less energy. 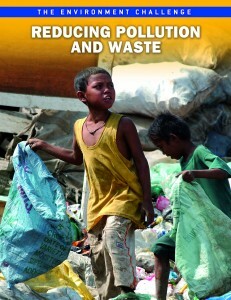 Reducing Pollution and Waste. Summarizes origins and impacts of pollution (overpackaging); local/global pollution (Chernobyl, acid rain); culprits of pollution (throwaway society); solutions (laws, limiting emissions); and the 3 R’s (reduce, reuse, recycle). The remaining three titles in the series are Avoiding Hunger and Finding Water, Coping with Population Growth, and Promoting Health and Preventing Disease. The author has packed a ton of information into each book’s 48 pages, but in doing so limits herself into really getting into the nitty gritty of the subject matter. For instance, in addressing food waste, author Jen Green does talk about how the Western diet is meat-laden and that growing corn (vs. feed for cattle) could feed many more people, but she doesn’t mention or suggestion eating more vegetarian foods or meals. While I felt pretty glum after reading these books, the series nonetheless provides a great introduction to students who may be new to the themes present in the series and may need a few more bells and whistles to keep their attention. A few things I did appreciate in the series include the case studies and the “What would you do?” sections, which challenge readers to think about the difficult predicaments politicians, corporations, and even ordinary people are faced with in balancing the needs of a growing global population and the limited resources on earth and the affected bystanders of our consumerism (the environment and animals). The environmental crises we face are DEPRESSING! I’m glad for your warning about the book, Carolyn, but I’m also glad for books that take on serious issues without lots of filler and fluff.